It only took 2 DIFFERENT kinds of pools and 16,000+ gallons of water…and we won’t even discuss how much this endeavor has cost…LOL! We still have to put the edging and pea gravel around the bottom to make it all pretty (and to catch the splashes so they don’t make mud) but Jacey has been able to swim the last two nights and is thrilled. Who knew though that a pool would be that difficult to put up?! Definitely not I. We started with one of the big Easy Set pools, the ones with the blow up ring on the top. Read the instruction manual (heck, we even watched the installation DVD)…easy peasy. Bryan brought some dirt in to level the area and then we started filling. Worked all the wrinkles out and then went to bed, so it could fill over night. Wake up the next morning to a severely lopsided pool. Drain the pool and try again. Before we drained though, we made a spray paint circle on the ground around the pool and marked the unlevel spots. It took several days to drain (who would have know that while it fills in less than a day, it only drains at a quarter of that speed) but then Bryan brought more dirt in and leveled the affected areas. Start the fill overnight, only to again wake up to a lopsided pool…this time in different areas. *sigh* By this time, Bryan and I are both getting very frustrated with the situation and are taking it out on each other. The boxes say ready for water in 15-45 minutes…yeah right! I get the bright idea to forgo the Easy Set pool and buy one of the metal framed ones. 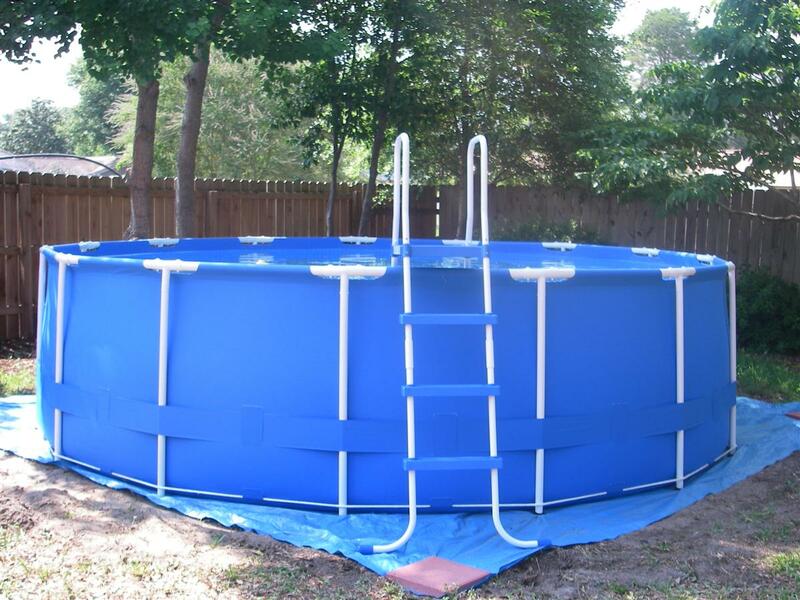 At least this way, we can physically see if the pool is level BEFORE wasting any water. Bryan and his Dad put it up last week and of course, not level. So, someone got the bright idea to use bricks under the low legs to make it level. Whatever, I was not fond of this idea but kept my mouth shut (a long story for another day). Start the water filling and work on getting the wrinkles out of the bottom a few times before going to bed that night. Wake up to discover that we had forgotten to tighten the rope on the bottom, so the legs splayed out with the force of the water and most legs weren’t on the bricks anymore. At this point, Bryan is done….given up. Of course, I coerce him with talk of how much his daughter will love him for it and how many smiles he will bring to her face. Yes, I know…I am bad! So, I go in search of tips on the internet. Surely we are not the only ones with an unlevel backyard or that have gone through these issues. Found what we both thought to be a great solution and headed to Lowe’s to pick up a 2×4 and a metal stake. Bryan attached the 2×4 to the stake and then used the 2×4 and a 4 foot level to turn circles and level the area. I wish I would have take a picture of what I am talking about. This worked wonderfully! Bryan did that Tuesday morning, Tuesday night we put the pool up, Wednesday morning I shocked and by Wednesday afternoon Jacey was swimming. Why couldn’t it have been that easy from the beginning?! Now I see why my aunt didn’t even bother trying to level the ground at her house and just stuck their pool in the garage, lol! It’s weird swimming in a garage, but at least it’s level! WAHOO!! So when’s the pool party, LOL! Glad you guys have a pool now. Hopefully it’ll bring some much needed relief to you this summer! Love your site….came across it when searching unlevel pools….we are experiencing that currently…my husband wants to know if your husband drilled a hole in one end of the 2×4 and put the metal rod through the hole and then used the board like the hand on a clock? (the second hand on the clock would be the 2×4)….laughing at my husband right now because he has me confused! If this works you would be a God send to our fam! Thank you and Happy Fourth!